Meet handsome Hank, he’s up for adoption at Alger County Animal Shelter in Munising Michigan. We get lots of snow up here in the U.P. 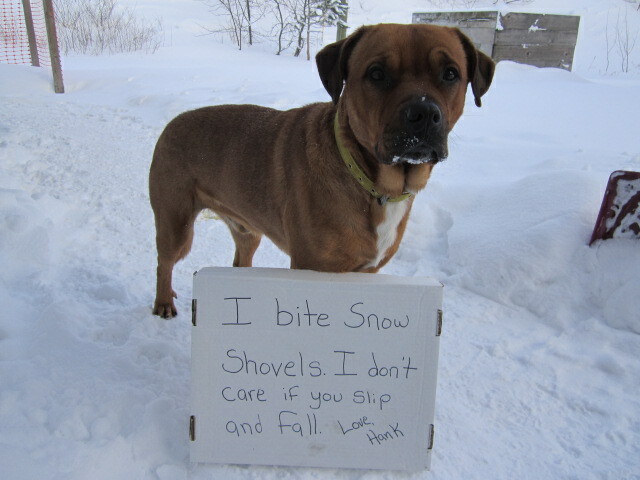 and if we try to shovel the sidewalks while Hank is around, he grabs the the shovel and runs away with it. Hank is a 1 year old Rhodesian Ridgeback/Boxer mix with a super personality. Posted February 1st, 2013 . Mine does the same thing to the vacuum cleaner. He gets an extra good workout “fighting” it while I’m cleaning. Wagging tail, though, so it’s all good. I would love to adopt Hank! !